The abdominopelvic cavity is a body cavity that consists of the abdominal cavity and the pelvic cavity. It contains the stomach, liver, pancreas, spleen, gallbladder, kidneys, and most of the small and large intestines. It also contains the urinary bladder and internal reproductive organs. 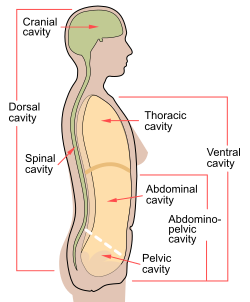 The abdominopelvic cavity 6 is made up of the abdominal cavity 3 and the pelvic cavity 4. The abdominopelvic cavity is made up of the abdominal cavity 3 and the pelvic cavity 4. ^ "abdominopelvic cavity". NDI Foundation. Archived from the original on 20 February 2013. Retrieved 2 April 2013. ^ "Abdominal Cavity Organs". TutorVista.com. Retrieved 2 April 2013. ^ "Common Anatomy Terms". Medical Billing and Coding. Retrieved 2 April 2013. This page was last edited on 26 November 2018, at 22:11 (UTC).